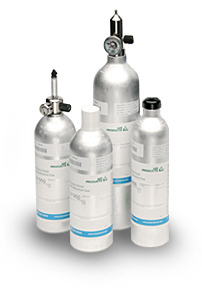 Envirosafe Ireland are the authorised distributor in Ireland for Air Products range of non-refillable calibration gases. As the gas canisters are non-refillable, the cost of cylinder rental is eliminated. Envirosafe Ireland’s canister range allows users to achieve the ideal compromise between gas capacity and portability. 4 different sizes are avaialble i.e. The aerosol type canister provides the ultimate in portability and ease of use. It is perfect where low volumes of gas are required, and it supports mixture shelf-life up to 5 years making it an ideal solution for low or infrequent usage. Our 34L is the smallest canister in the range featuring the universal C10 valve. This high specification aluminium canister, combined with advanced treatment processes, makes it suitable for all mixture components including H2S, SO2 and highly reactive components like Cl2 and HCN. The C10 connection facilitates use with a wide range of gas control equipment for varied applications. 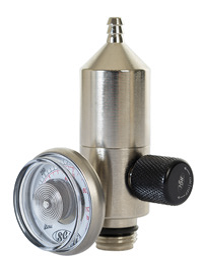 The 58L is the second largest canister to feature the C10 valve. Its unique characteristics means that it supports highly stable ‘quad’ gas mixtures used extensively in the field of gas detection and industrial hygiene. Our 110L canister represents the ultimate in economy. A higher fill pressure means it contains twice as much gas as the 58L canister, yet has similar physical dimensions. This highly popular canister is designed to support both non-reactive and reactive mixture components including H2S, SO2 and NO2. It is used extensively in a wide range of applications where high gas yield is needed without compromising portability and ease of use. All Air Products’ canisters are dual approved, meaning they can be used and offered for sale in virtually all regions around the world. All of our gas mixtures are issued with hard copy certificates of analysis that exceed the requirements defined in ISO 6141. We also offer an extensive equipment range including regulators, flow valves and carry cases. To compliment our extensive range of non-refillable canisters we have a diverse portfolio of regulators suitable for almost any application and flow rate. Air Products carry cases are the ideal solution for the safe storage and transportation of your non-refillable canisters and regulators. They are versatile enough to hold any combination of aerosol, 34L, 58L, or 110L canister. The recycler tool allows used non-refillable cylinders to be punctured and safely recycled. In the European Union, punctured non-refillable cylinders can be recycled through the normal waste stream as nonhazardous. It is not recommended that toxic or flammable gas cylinders are punctured. These can be returned for safe recycling. Safety glasses should be worn at all times when using the recycler. Prior to puncturing, the cylinder must be completely empty. It is recommended that EIGA IGC document 30 Disposal of Gases is followed before puncturing. This is available as a free download from www.eiga.org. The operator should be familiar with the properties of the gas as described on the safety data sheet, paying particular attention to safety and environmental data. The tool should be fixed to a stable surface using two M6 bolts (not supplied). Place the empty cylinder centrally in the recycler tool and wind the handle slowly clockwise until the cylinder is fully pierced. As a precautionary measure it is advisable to carry this out in well ventilated area such as a fume cupboard or outdoors. The handle should now be wound slowly anti-clockwise to release the cylinder from the tool. The cylinder can then be recycled or disposed of by the preferred method. Alongside our extensive product portfolio we have access to Air Products’ comprehensive support network to ensure our customers are never far from technical advice and expertise.